Bread to be proud of! It was one of our Supperclub nightmares – a gluten-free guest! But I know now that we’d manage if it ever happened, because when one of the Walthamstowfoodies had to go wheat-free for a while, we decided to sign up for the gluten free and alternative flours bread-making course with the Hornbeam Bakers Collective at the Hornbeam Cafe in Baker’s Arms, Walthamstow. At only £30 for an all day course including making three organic bread loaves to take home, the Hornbeam Bakers Collective courses are fantastic value. Starting at 11am, it’s a lovely, relaxed Sunday spent with a knowledgeable tutor and a group of about 12 others in a friendly, community cafe atmosphere. After an initial introduction to the various types of flours and the problems with both digesting gluten and baking without it, we tried out a simple wholemeal spelt dough. 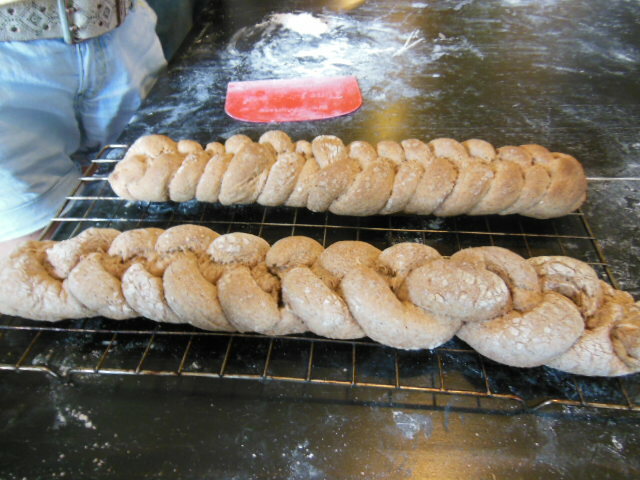 At the end of the day we shaped this into a variety of plaits and rolls. After a vegetarian sharing lunch, we also made a delicious rye sourdough loaf and a 100% gluten-free flax-seed bread using buckwheat, rice, corn and potato flours. We came away with loads of recipes and ideas, sourdough starter instructions and a jar of homemade sourdough starter . Unfortunately after only one fantastic loaf I’ve managed to kill this again – but at least I know how to make a new one now. You would not believe how proud we were of our efforts. 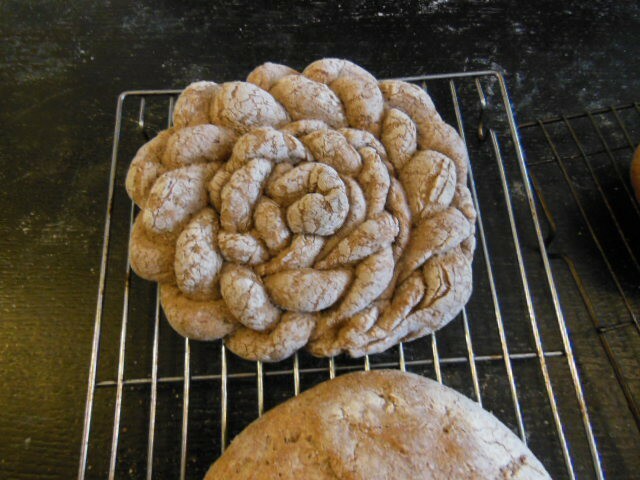 This entry was posted in Foodie Finds and tagged alternative flours, bread, bread baking course, Flour, Gluten free bread, Gluten-free diet, Hornbeam Bakers Collective, Sourdough, Walthamstow, wheat free bread. Bookmark the permalink.